This was first introduced to me by Ate Juvy, my neighbor in Philippines. There are positive and negative feedbacks over the internet about these products but since I am curious, I want to try it myself. I bought the whole package at SGD68 (Php2,380.00) only instead of SGD85.80 (Php3,003.00). Ate Juvy said its about Php500ea only in Philippines so the price difference is quite depressing. Anyway, the saleslady gave me a free 5ml Salvatore Ferragamo Attimo Eau de Toillete. She's was quite good in selling, so I bought it. The package includes Blackhead Out Oil Gel, Tightening Pack, and Silky Smooth Balm. Sorry, the gold egg pore should have a gold cap but I broke it. Tony Moly is South Korea’s popular beauty and skin care brand which brings forth a whole new beauty experience with top quality and yet affordable wide range of products. The all natural and organic products with no animal testing or specimen contents comes in chic and stylish packaging. So, since it's from Korea, I was thinking of the pretty cute faces of those Korean singers and actresses. It convinced me more. So here's how to use: you may not use all of these but they said it's better to use the whole package to give best results. 1.Eggpore Blackhead out Oil Gel - The oil gel effectively purifies the whiteheads, blackheads, excessive sebum and trapped dirt in the deep pores. So, this first capsule promise to remove dead skin cells and excessive sebum. After cleansed skin, apply an appropriate amount onto areas with blackheads and gently massage for about 3-5mins. Rinse off with lukewarm water. *Clear oil gel turns white because of the interaction with sebums while massaging. 2. Eggpore Tightening Pack- Containing Bentonite and Kaolin from Clay components which absorbs dirt and sebum in pores and gives a deep cleansing feeling. So this time, it promises to manage excessive sebum secretion and trapped dirt while tightening the pores at the same time. After cleansed skin, apply an appropriate amount onto areas with enlarged pores. Leave it on for about 10~15mins and rinse off with lukewarm water when the pack is completely dry. 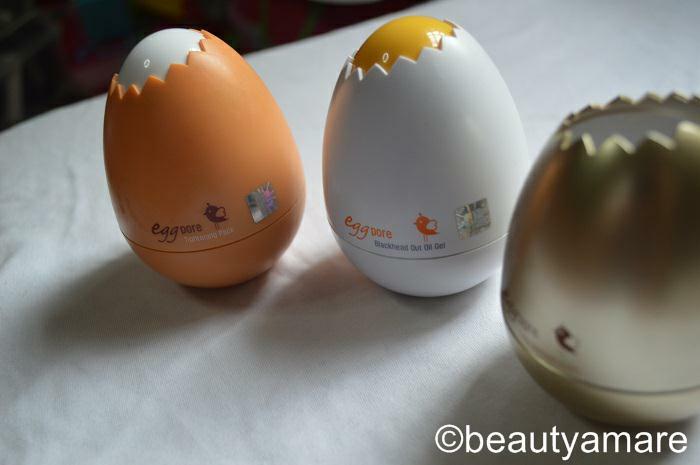 Recommended to use together with the Egg Pore Blackhead-Out Oil Gel for optimum result. 3. Last but not the least, the Eggpore Silky Smooth Balm -Art skin gel balm type primer conceals the enlarged pores, fine wrinkles and minor scars to give the skin a velvety smooth, soft and silky look. After sun care products, apply an appropriate amount onto the affected areas of skin irregularities before applying any makeup products. For external use only. Do not apply to areas of the skin where sores, Eczema or dermatitis occur. Do not swallow and avoid contact with eyes or on skin which is sensitive to bandages or pad cloth. Discontinue usage and consult a dermatologist if signs of skin irritation and/or rash appear. Keep out of reach to children and store product away from direct sun exposure. This Product is qualified for CGMP (Excellent Cosmetic Manufacturing and Standard qualify management). 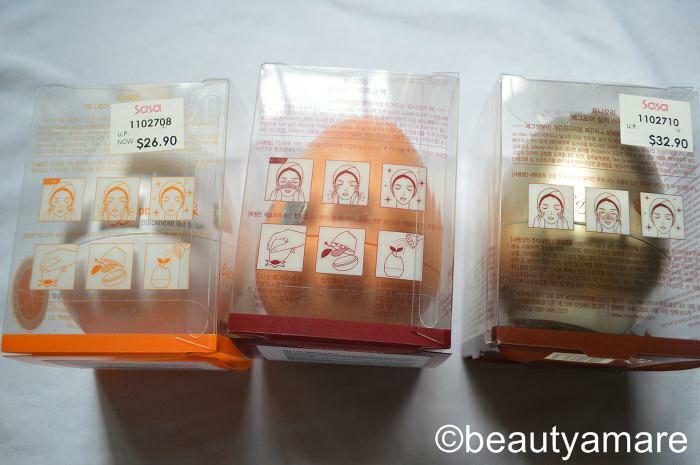 Packaging: Pretty cute packaging except for the Blackhead Out Oil Gel when you close it, it will literally drip-out. So you have to be careful when closing it.